Stock status is current as of 4/22/2019 10:44 PMET. 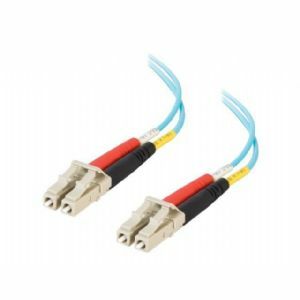 This laser-optimized multimode fiber (LOMMF) cable provides backward compatibility with existing 50/125 equipment while providing the performance headroom required to support laser light sources and 10 gigabit applications. Optical Multimode 3 (OM3) fiber supports 2000 MHz/km EMB at 850nm, and provides 10 gigabit transfers up to 300 meters using an 850nm VCSEL source. Jacket is OFNP plenum-rated to provide the fire protection required to run within walls and air plenums without the need for conduit.